Yes, everything in the heavens, including Planet Earth declares the glory of God! Even the tiny things found in nature declare the glory of God! And in Part 1 of this devotional, The Chrysalis Christian, it was seen that the butterfly and its caterpillar present an incredible allegorical drama of the Christian life. Behold the little caterpillar worm, as it spends its earthly days in the grass, or on a leaf of a tree, merely living to eat of the earth’s produce. But in the course of time, that little worm grows tired of this earthly estate. And so, it begins to spin itself a chrysalis. And for 14 days, this little worm dies a death. But afterward, it emerges an entirely new creation! And now it takes to flight, ever searching for the sweet nectar of every correct flower. American Lady Butterfly Against The Sky – Wikimedia – Creative Commons Attribution-Share Alike 3.0 Unported license. Of course, this allegory of the caterpillar turning to a butterfly, speaks of the death to ‘self’, and death to this present world, that every true Believer must go through! And once that Believer finally dies to self, Christ can then live out His life of agape love through that empty vessel. Like the butterfly, the Believer becomes an entirely new creation in Christ! And of course, the gathering of sweet nectar symbolizes the new life of the Christian, who forevermore seeks the life-giving power of God’s Word! And in the process of gathering nectar, the butterfly cross-pollinates all the flowers it comes in contact with, symbolizing the Christian, as he or she spreads the Gospel seed, wherever they may go! Now the moth is the veritable anti-butterfly! The moth symbolizes “false brethren”, who join the Church, but never become true Believers. They are merely “Make-Believers”! Oh yes, when still in their caterpillar stage, it’s hard to tell them apart from the butterfly/caterpillar. And they too, go through a metamorphosis. But their change is not at all like the caterpillar-to-butterfly! Instead of having wings which are lifted up toward Heaven, the moth’s wings are horizontally directed down at earth! Instead of sipping the sweet nectar from flowers, it often eats the wool from clothing! Of course, wool symbolizes the covering of lambs, and lambs symbolize Christians! “though your sins be as scarlet, they shall be as white as snow; though they be red like crimson, they shall be as WOOL.” Isaiah 1:18. But there is an exception to all this. Yes, the Bible speaks of silk. Listen… “She maketh herself coverings of tapestry; her clothing is silk and purple.” Proverbs 31:22. This verse is speaking of the virtuous woman. And of course, this virtuous woman symbolizes God’s people. And the silk spoken of here, symbolizes Christ’s covering over His people. 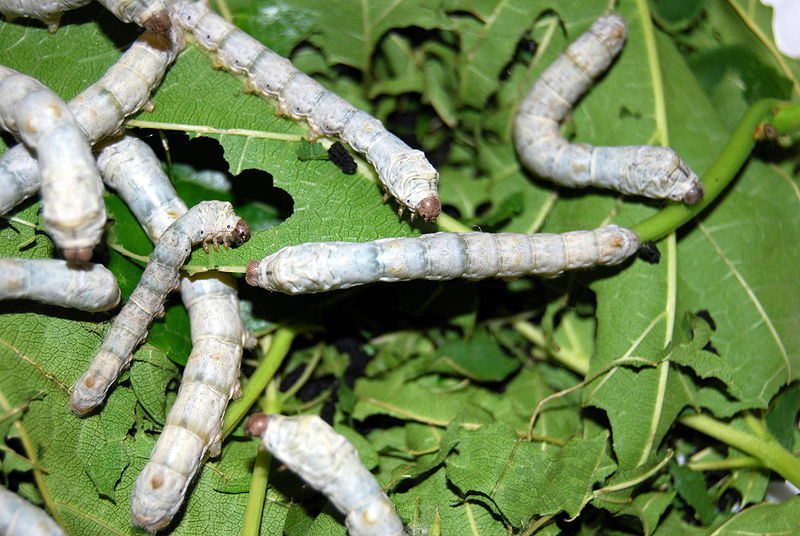 Now silk comes from a little caterpillar worm, which when domesticated, spins a cocoon, which is harvested for silk. And when this cocoon is boiled for strength, the caterpillar inside the cocoon dies. Then the cocoon is made into silky thread, then made into beautiful and soft silk clothing! But why did God decide to use a moth-caterpillar? Why didn’t He use a butterfly-caterpillar which represents Christians? Why is God always doing things which make no sense? Well, it is for certain that Christ is the One who provides the virtuous woman’s silken garments of Salvation. But how did Christ provide those garments? By taking on our sin, and paying our debt, as He died in our place! Yes, Christ became sin for us! He became the object of God’s wrath in our place! In His great love and mercy, God suffered the penalty for us, to fulfill the Law’s demands! “For He (God) made Him (Christ) sin for us, who knew no sin; that we might be made the righteousness of God in Him”. The above words were Jesus’ thoughts as He hung on the Cross for our sins. And He called Himself a worm! And this Worm, Jesus, died to provide our silken covering of Salvation. Yes, even a lowly little caterpillar worm declares God’s glory and righteousness! Yes, the virtuous woman in Proverbs 31, symbolizes the Church-faithful. And her white silken clothing represents Christ’s righteous white covering over His Church. 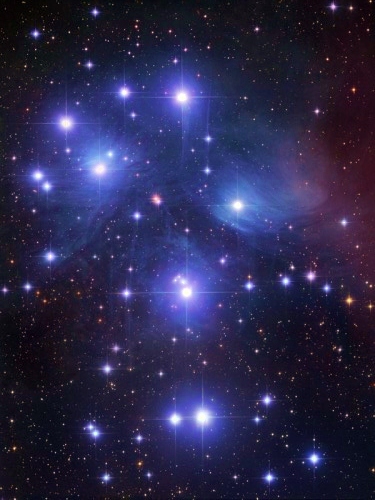 The above two verses concerning the Pleiades are all the Bible has to say about the Pleiades, directly. But if you will read this article, you will discover that the Pleiades represents concepts which span much of the Bible. This is partly because Pleiades is a constellation within a constellation. And this double-entendre constellation presents perhaps, a picture of the greatest truth regarding the Church, found in the Bible.